My dream was to become an archaeologist, just like Indiana Jones. I never became one. Like the majority of people I succumbed to logic, choosing to travel the safest route possible in life. Instead, I spent twenty unfulfilled years in an industry that I did not enjoy. I would drag myself out of bed every morning asking, ‘Why am I doing this?’ I, a lover of history, gave away my soul. I used to blame my parents for not pursuing my greatest aspiration. It was a good excuse. My father would tell me that nothing good could come of it. He constantly reminded me that archaeologists spent their entire lives doing tedious, undervalued work and were often under paid. ‘What could you possibly dig up in Canada? There’s nothing here. You should become a lawyer. Now that’s a solid career!’ he would say. I understand my father’s concern for my financial well-being and I can not blame him. However, I know he would have supported me in any career path I chose. The science of Archaeology sprung from the aristocratic class, people who had the financial means and the time to devote to intellect and their personal interests. It was a pass time for only the very wealthy as most of their expeditions were quite costly and had to be funded personally. In the modern age archaeological digs are funded by various universities, organizations and by private donation. It was quite possible for me to participate in an existing expedition as long as I paid for it, but it would come at a hefty price. Eventually my dream became a reality for me. It came by chance and it cost me absolutely nothing! 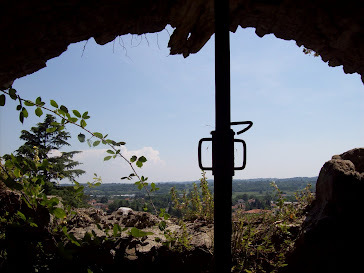 In August of 2008 I decided to pay a visit to my Grandparents in Friuli Venezia Giulia. They are from a little village called Artegna, at the foot of the Julian Alps. It is a typical medieval town with a church and castle situated on a small mountainous hill with homes, shops and bars scattered below its circumference. The route from Udine train station is magical, as the Alps are a backdrop to Artegna and the other nearby hilltop towns. It is like a scene from The Sound of Music and its beauty takes my breath away…every time. 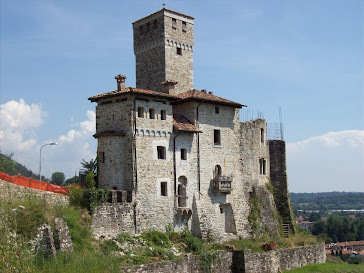 That summer the villagers had informed me that there was an archaeological dig taking place at Artegna’s Castle Savorgnan, spearheaded by the Universities of Milan and Udine. They seemed indifferent towards it. Europeans, I think are desensitized to their history because they are inundated by it. I, on the other hand, was excited at the prospect of observing a live expedition rather than watching one on the National Geographic or the BBC! A few days after I arrived I told my family not to hold lunch for me as I was going to climb the hill and take some snaps of the castle and the dig. My Grandmother warned me that it was futile. She reminded me that she had lived in the village all her life and that no one had ever been granted entry to the castello. She was worried and told me I would be a nuisance to the archaeologists or worse, get hurt on sight. Ignoring her, I threw on my running shoes, grabbed my camera and up the hill I went. Three quarters of the fortress and its protective walls have been destroyed over centuries from various battles and severe earthquakes. The original structure was in wood and built over two thousand years ago by the Celts, the original founders of the village. Then the Romans arrived, forced the Celts north (that’s how they ended up in Scotland) and eventually claimed it as their own. The Romans utilized the Pre-Alpine plain as a sort of military outpost area. All the neighbouring hilltop towns are original Roman fortresses initially constructed to protect the Italian Peninsula, barring the entry of Barbarian invaders. Viewing a map of the region, one can actually see that these communities are geometrically aligned north to south along the foot of the mountains and equally distanced. Those Romans were military geniuses. Later, with the rise of medieval feudalism, the fortress also became a residence inhabited by the Counts of Savorgnan. Little houses began to spring up around it for protection, commerce and trade. I searched around me and was disheartened when I could not see the archaeologists or the dig. Glancing down at my scoured legs I decided in that moment that I did not make the perilous journey through the thorn bushes for nothing and that I was going to get inside this bastion of rubble. I looked up and found a window. I climbed the wall and jumped through the opening. Here I was, Indy himself, starring in Indiana Jones and the Dilapidated Castle. I found myself in a courtyard overgrown with ivy and all sorts of mysterious vegetation. It was in shambles and the steps leading into various doorways were weathered and destroyed. I was faced with yet another challenge and after exposing my body to just a few more subtle injuries, I made my way inside. I saw mounds of debris and stone everywhere. I walked slowly from one room to another and then up a stone staircase into another room. I found myself in an architectural maze wondering how I was ever going to find my way out again. I embraced the peace this tireless edifice seemed to evoke. I was not a puppet on an organized tour or visiting a museum. I was on a journey of discovery, not only of the castello, but of myself. I realized this wasn’t just a building in ruins. This was the tangible history of my people. Every room held a surprise; a stone fireplace, an afresco painting in a dining hall, a little peephole out onto the bustling village below. I leaned on a balcony overlooking the main entrance, conscientious of every emotion stirring within my soul. What a sight I must have been with caution tape and do not enter and danger signs all around me! While basking in my state of euphoria, I heard a voice yelling out to me, ‘Signorina, are you selling?’ I looked down onto the main road and saw a fine, tastefully dressed, middle-aged gentleman leaning against a black Mercedes. He was the vision of a modern day Romeo. Chuckling, I told him that the building was not for sale and that it was owned by the State. He seemed genuinely disappointed when I told him of the renovation project. He asked if I was a local and I told him no and that I was a visitor exploring the premises. He said he was from Milan and just passing through. He thought Castle Savorgnan would make a fabulous residence for himself and his family. I told him I thought it would make a beautiful hotel, restaurant or lounge. Disgusted he said, ‘You must be American’ and drove away. After the departure of my new friend I began making my way out, circling each floor several times before finding a stairwell which would eventually lead me out to the courtyard. I found my original entry and climbed out. It was then that I heard loud voices adjacent to the fortress. Squinting my eyes to repel the blinding sun, I looked over and saw movement by the gatehouse. Finally, there it was…the dig!